Professional Graphic Designer with more than 3 years of experience with graphic designing of social media marketing items like Logo and Brand Identity, Google Banners Ads, Facebook Cover Page, etc. I am innovative and my work is focused on needs of target audience. Professional and Quality work are my top priorities. 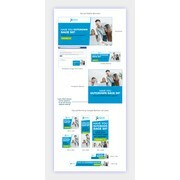 Do have a look on my portfolio for examples of Banners, Facebook Cover Pages and Home Page Banners. "We came to a perfect blend of the vision." "Awesome banner designer! I will be using again." "Great work! Truly a pleasure to work with." "great job! fast communication and creative vision with minimal direction." "Display adverts created for a social media lead generation campaign. Anjali impressed with both her designs and her explanation of the design elements." "Great work & perfect communication. Thanks !" "Job well done. Responsive to changes." "Anjali_GlowCanvas was a pleasure to work with. He nailed our design and quickly make the few revisions we asked for. I hope to work with Anjali_GlowCanvas again soon."